Either during the initial job interview or your first week in the car business, you were probably told (as I was) that selling cars is the only career that requires no college degree and no experience yet will afford you the opportunity to create your own small business. Your dealer principal will provide the capital, the marketing, the inventory and the facilities; your sales managers will provide the leadership and (some of) the training; and what you make of this opportunity is entirely up to you. Guess what? You weren’t lied to – this is all true! There are plenty of salespeople today who “own” their book of business. Whether they stay at their current dealership or move across town, many of their customers will never buy from anyone else. Creating your own book of business, by the way, should be one of your goals – because this is the only way to ensure both job security and long-term financial success from selling cars. If you’re new to car sales, you probably don’t know that most salespeople fit neatly into one of three basic categories: They can be superstars; they can be average; or they can be slugs. You can probably guess right away that you don’t want to be a slug. The great news for you is that Assumptive Selling was written to make everyone a superstar. And, yes, everyone can be a superstar. Regardless of what you’re selling, sales is the only profession where the players don’t fit on a bell curve. (A bell curve, for the uninitiated, is a typical distribution of values where nearly all the results are bunched together in the middle with just a relative few on the extremes.) For example, if we plotted the monthly results for all the salespeople at a well-run dealership, you’d quickly see that everyone is crowding the right side of the graph. That is, they’re all superstars. Depending on the brand and location, superstar salespeople average between 25 and 100 units a month. Yes, you read that right, there are salespeople like Ali Reda of Dearborn, Michigan who can retail more than 100 units in a month. In fact, Reda reportedly sold more than 1,500 new vehicles in 2017 (source). This, while the average salesperson in America still retails only about 8 to 10 cars every 30 days. Slugs, you might have guessed, average fewer than 8 units a month. Interestingly, whatever your success selling cars – whether you’re a superstar, a slug, or somewhere in between – you are the sole cause of this. Yes, you and only you decide whether you’re going to average 30 units or 8 units. This has been the reality for decades in automotive retail, and it doesn’t matter if this is your first month in the car business or if you’ve been selling for twenty years. Top sellers don’t freelance with every Up. Quite the contrary – top sellers are known for treating every prospect the same and sticking to a strict sales process every time regardless of which rabbit hole a prospect tries to take them down. They do this because they know that process outsells everything else. It always has, and it always will. With all the cool, shiny new stuff that gets thrown at dealers on an almost daily basis, I’m often asked why I still focus so heavily on sales processes? Why don’t I spend more time helping dealers evaluate and incorporate the latest and greatest magic bean, and less time harping on the basics? It’s simple. Those salespeople who succeed month-after-month, and those dealers that grow share regardless of market condition have superior processes to those that merely tread water (or worse). Moreover, the dealers with the strictest process adherence are better at evaluating and incorporating the shiny new stuff than those flying by the seat of their pants. This is all too common in automotive retail; but, it’s certainly not your problem and it’s definitely not a reason that’s keeping you from selling 30 or more cars every month. It doesn’t matter what your sales managers demand since your sales success is driven by you. You’re the only one who can get you to 30 units this month… and, you’re the only one to blame if you fail. Your store’s lack of process should be looked at as an opportunity. I mean, at least you’re not being forced to follow some outdated road-to-the-sale that blows out more buyers than it closes. With no formal process in place, you are free to practice Assumptive Selling and free to create and strictly follow your own good processes. For your processes to be considered good, they must be made up of simple, repeatable steps that you precisely follow with every Up. Is your success worth a $50 investment? 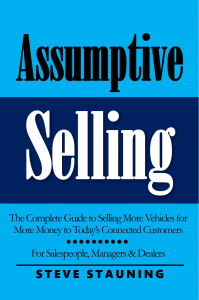 If so, learn the Assumptive Selling processes and talk tracks top sellers use today to sell 30 or more units every month – regardless of their dealership’s size or the number of Ups coming off the Up Bus – order Assumptive Selling on Amazon right now! For discounts on orders of 20 copies or more (sent to the same address), email us at Sales (at) SteveStauning.com. « Power Off to Power On! » The Best Car Selling Book Ever!